Drawing allows us to see the world more clearly, to put our thoughts in order and to communicate them effectively. Drawing is a powerful tool for learning, and a valuable skill for life. The Campaign's annual Big Draw festival runs throughout October, involving over a thousand organisations across the UK and twenty other countries and offering events for every age and level of experience. 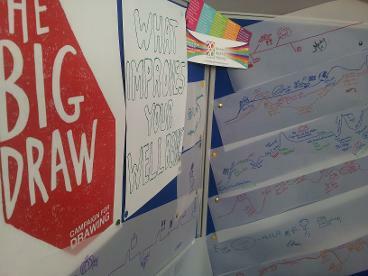 In July 2012, Halton’s visual arts development officer Louise Hesketh, was approached by Dr. Cliff Richards, on behalf of the clinical commissioning group to create a project for the 2012 Big Draw, held annually in October. 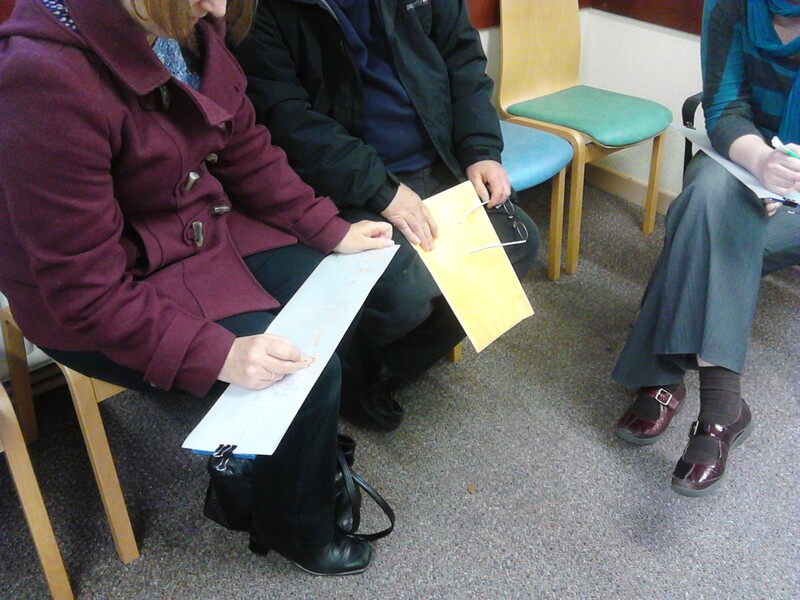 It was proposed that drawing events would take place in Halton’s GP surgeries. In September, with the involvement of Mark Swift, managing director of the Wellbeing Project CIC, and subsequent funding support, a programme of workshops was developed. Three artists, Claire Weetman, Angela Sidwell and Jennifer Kenworthy were approached to develop ideas for the programme. All three artists are members of Markmakers (Halton contemporary visual arts collective) and the group have worked closely with Louise Hesketh to develop ideas for drawing exhibitions and workshops for previous Big Draw events. Community Wellbeing Officers joined the artists at the workshops and were instrumental in encouraging members of the public to join in. Co-ordination was provided by Catherine Jackman. 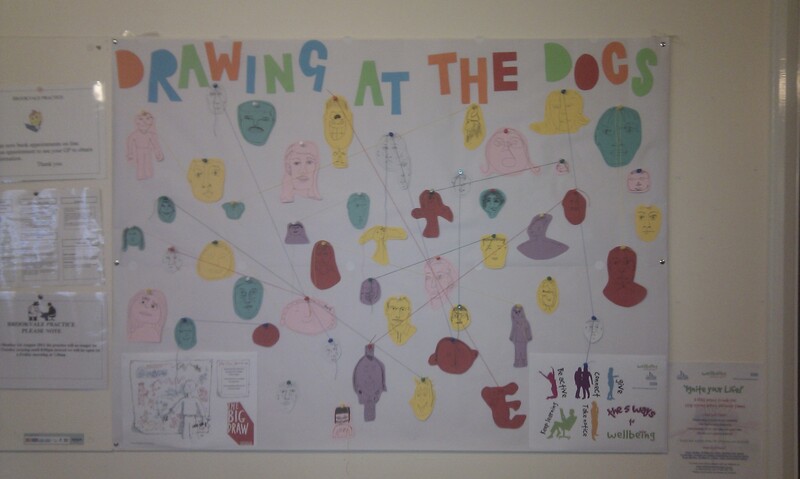 For the “Drawing at The Doc's” workshop I would approach participants by chatting about the Big Draw project and particularly the drawing workshop that was taking place at the centre that day and how if they wanted to they could be involved. I would explain that the theme was health and well-being and that we would be using this theme to inspire sketches and wire sculptures that would connect together to make an overall art piece that would be hung at the centre. I would have a few examples to show people of wire drawings/small sculptures. Participants could take inspiration from something positive that had happened to them that day i.e. “I saw a... which was beautiful and made me feel happy” “I ate a .. which made me feel good” “ I spoke to … “ etc... Sketches could be of, for example, a flower, apple, conversation, sport. These sketches would then act as a guide for a wire piece, created by bending single strand wire over and around the shape of the sketch. Taken off the paper participants would then have wire outline that could be further embellished with more wire detail or taken to a further dimension in 3D. There would be galvanised (silver), copper and coloured wire to use. At the end of the workshop I would join the art works together to create a “Health and Well-being” composition that could either hang from the ceiling or against walls. Wire works really well hung from a short distance from a plain wall as it casts shadows of the work which are very effective. Hopefully the workshops should directly link to the five ways to “Health and Well-being” as people will be connecting with other people involved in the project, are being actively involved in something, giving their efforts for the benefit of other people who will see the work, exploring new ways of working/using new materials and creating a beautiful object! Local artist John Gaul from Castlefields volunteered to lead a sessions he called ‘Art Experience at the Castlefields surgery. The session was based on a painting that John had produced previously, as he stood painting his painting he invited patients to join in in painting a second painting as you can see from the picture. Everyone who was involved in the work has signed it and their names along with the painting will be placed on display in Castlefields practice. Louise Hesketh and Catherine Jackman are working together with Castlefields surgery to develop Poetry at the Practice, with Liverpool author Mick Moss. 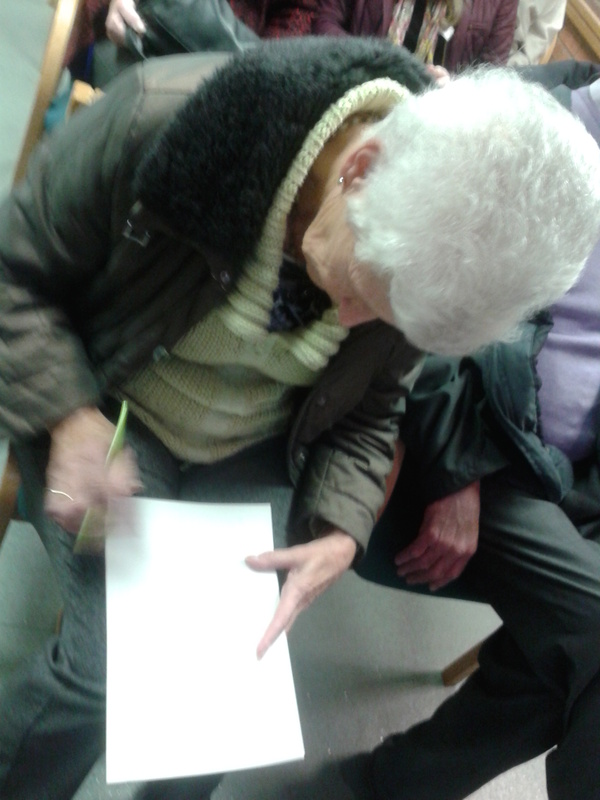 Mick currently leads the Years Ahead creative writing group in Runcorn and through this partnership we hope to develop poetry sessions at the surgery, with a route to further opportunities through Years Ahead. The partners from this project are looking forward to continuing to work together and learning from this year’s Big Draw to develop further creative activities in Well being practices across the borough. I'd like to create a drawing with people that is similar to the lines that I drew on a bus and exhibited at the Bluecoat. These lines had a similarity to a heartbeat trace on medical equipment, but had a human side to them due to their wiggliness. I'd like to work with people to create a scroll that features a similar line, but then can be embellished with drawings and writings about the ups and downs of life. This could be done either in a waiting room or with a clinic group, or even on the mobile library! I'd prepare the scroll so that participants can add to it. The line will be a reflection of how people connect to others. Being a scroll, it could be worked on a small section at a time or by many people when it is opened out. It could also be joined to another scroll from a separate session if more than one session takes place. A line that looks like a heartbeat trace will be already drawn onto a scroll of paper. I can sit in a waiting room with a badge that identifies me as 'artist in residence'. I will sensitively approach people and ask if I can tell them about my project. I will tell them about the line on the scroll which will be a description of when different people have connected with other people. The line will rise for when people have connected with someone and fall to represent time alone. People that I talk to can tell me about how they connect with others, and can draw a line themselves, or describe one to me. Multiple colours of lines will represent different people anonymously. I'd like to collect anonymous comments that come up from the conversations, which can also be written along the scroll at pertinent points on the line. Participants will be given an information sheet with contact details for the project, so that if they wish to withdraw their permission for their comments then they can. The completed scroll would be able to be displayed in a display cabinet in its paper form, or could be transformed into a graphic that could be used as a larger art work maybe on a wall or window. There would be extra print and design cost if this was required. 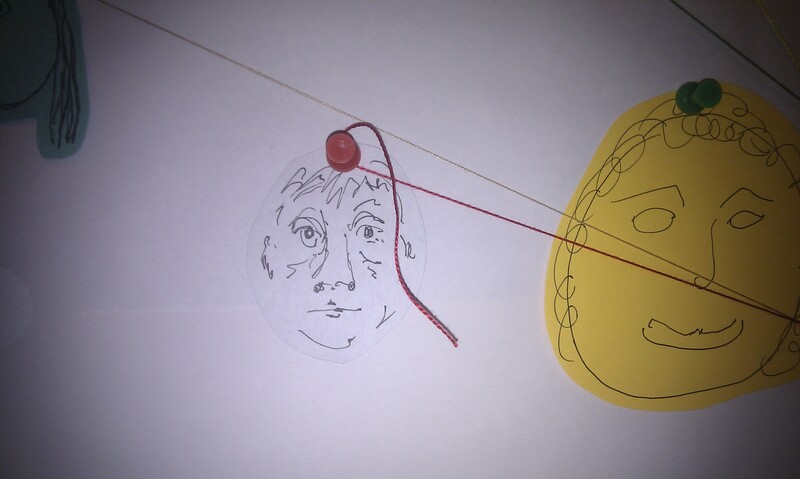 I am hoping to ask participants to create a small continuous line drawing with a fine liner of their face and one other person at the surgery (can be someone they know or not) onto coloured card. These faces will then be collected and cut out by me. These faces will then be attached onto a display board in the surgery with pieces of coloured wool indicating the connection between each face. For example, a drawing of one face would be linked to another with the word 'friend' perhaps. As I slowly collect more faces we will begin to create a visual representation of the community that attends a particular surgery and how each person is linked to one another. The display will be brightly coloured and hopefully draw people in to take an interest in what we have created. This piece will build upon the themes of 'Take Notice' and 'Connect' from the 5-Ways to well-being. I will approach people by example, asking them to take part. We also hope to have a display board which will tell people what we are doing. Halton-based artist collective Markmakers have been in residence at the Crmz, a new youth centre in Widnes as part of the borough's Big Draw activities. Artists Carys Anne Hughes, Jennifer Kenworthy, Sharon Lelonek and Claire Weetman spent the half term week working with young people at Crmz on a variety of drawing activities. Carys Anne Hughes took her embroidery practice to the youth centre, creating a curtain with the young people that used continuous line drawing and pattern. Jennifer Kenworthy, whose work features drawing, embroidery and landscapes, created images on a glass wall with the participants. Using sticky vinyl, they built up images in small pieces. Also working with the architecture of the newly refurbished building was Claire Weetman. In one of her works 'Dicing with Drawing' participants were asked to generate random numbers by rolling dice. They were then able to connect two numbers on the glazed wall of the building using black tape. Young people also created versions of this on paper, using a variety of drawing materials, the results of which were exhibited in the new exhibition frames for their peers to see. The idea to make drawings of eyes came from the work that Markmakers member Sue Archer had created with a local primary school. The work pictured here is a hanging made from felt that features eyes, noses and mouths, creating abstract faces as it is viewed. 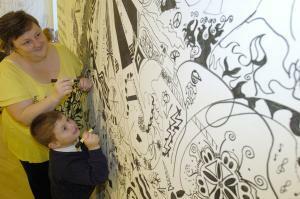 Building on the success of 2009 Big Draw exhibition, the Drawing Show is back for an extended run. 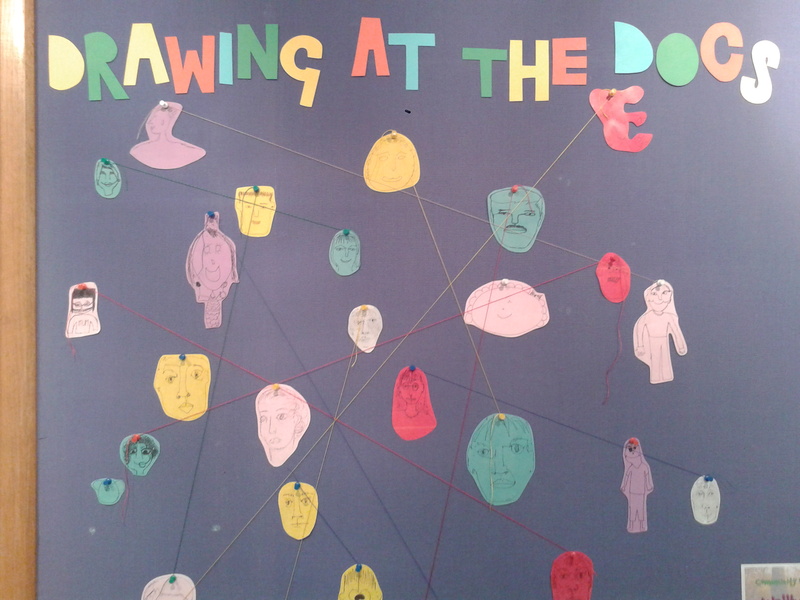 The interactive exhibition featured a range of drawing activities to take part in. Join the artists from Markmakers; Halton’s visual arts collective, and students from local schools in making their mark in our space. Louise Hesketh, visual arts development officer at The Brindley, hopes the event will spark new interest in art from young and old. Artist Sharon Lelonek created an interactive beach so visitors could add drawings of shells and crabs and Claire Weetman promoted large scale still life with drawings from St Bede’s Infant School and the Brindley’s Saturday art club on display to provide inspiration. 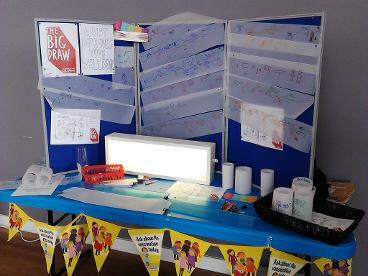 As part of the national Big Draw programme an interactive exhibition featuring a range of drawing activities to take part in. Join the artists from Markmakers; Halton’s visual arts collective, and students from local schools and colleges in making their mark on our walls. This UNIQUE ‘hands-on- exhibition invited visitors to pick up a pen and draw onto professional works of art. 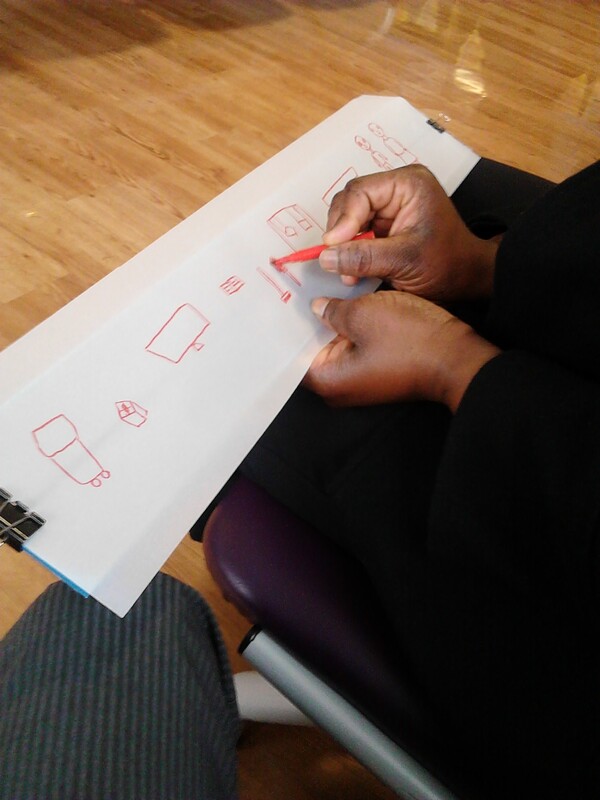 A fascinating range of interactive activities at The Brindley encouraged everyone to add their mark. There were instructions with each activity, along with paper and materials including coloured pencils, marker pens, pencils and crayons. You don’t have to be an expert - just have fun. In Clare Weetman’s piece, you traced over the image projected from a camera. 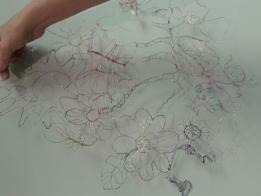 In the window, participants` added to Cathy Rounthwaite’s distorted cat’s cradle by drawing with wool, thread and wire. 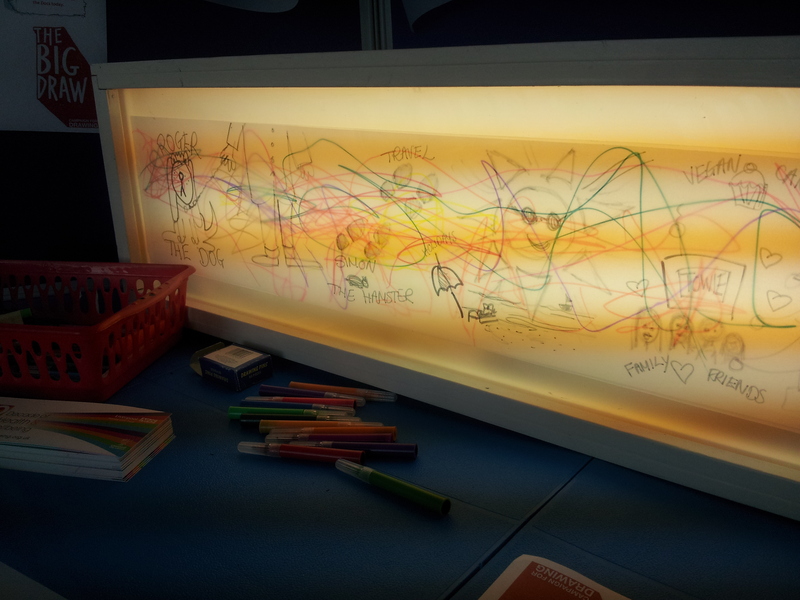 You could make patterns with Jeni McConnell’s activity and in Carys Hughes’ table piece you had to draw what you felt, not what you could see. Sue Sharples invites you to and Visitors added to Sharon Lelonek’s abstract graphic on the end wall. Amanda Oliphant challenges participants to draw your house.